NEWPORT BEACH, CA, Nov 8, 2016 – MSC Software Corp. announced the new release of Marc 2016. Marc is relied upon by product manufacturers for nonlinear and Multiphysics simulations of engineered products ranging from automotive rubber components to aerospace composite modeling and for Multiphysics analysis of medical and consumer electronic devices. Accurate simulation of complex material behavior depends not only on constitutive formulations, but also on the physical testing that needs to be done in order to characterize them. Marc 2016 introduces multiple material modeling capabilities, enhanced data fitting for material characterization, and additional user productivity enhancements. Understanding phase transformation of materials helps to optimize the manufacturing processes such as welding, casting, forging and heat treatment. Manufacturing engineers can use Marc 2016 to model as many as 5 phases, and predict material hardness, strength, residual stress distribution and final distortion. Five new methods are introduced to define the flow stress as a function of the equivalent plastic strain, strain rate, temperature, and user-defined parameters. 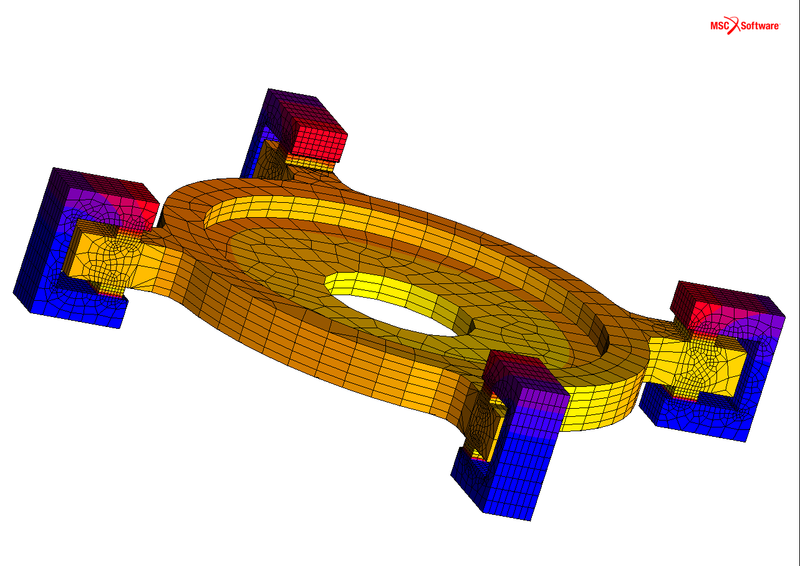 This provides added flexibility in the choice of plasticity models, especially for manufacturing process simulations. Johnson-Cook damage model is frequently used in the engineering community to model damage progression in metals at elevated temperatures and high strain rates. This model, available in this release, can also be used to predict tearing or fracture of metal during operations like riveting process. Characterization of materials requires derivation of specific parameters from test data, which can be a cumbersome task for complex models. Marc 2016 introduces data fitting capabilities for recently introduced elastomer models, including Bergstrom-Boyce, Payne, and thermorheologically simple viscoelastic materials. Engineers from the automotive, aerospace, machinery, and oil and gas industries, working on elastomers will save time and effort coupling test data with analysis. While the contact set up has always been easy to use with Marc, contact results with the traditional node-to-segment approach depends on the body ordering. A new capability is introduced in segment-to-segment contact method to overcome this limitation which helps users set up and solve complex contact problems faster. The parallel processing technology has also been enhanced to support the segment-to-segment contact method enabling users to run contact analyses twice as fast using a 4-core system, which improves their productivity. Local adaptive meshing is often used to get better accuracy in regions of high gradients by refining the mesh in these regions. The mesh refinement based on contact detection has been enhanced to provide additional flexibility to users and to reduce unneeded refinement for better performance. Mentat, the user interface of Marc, has been enhanced by the addition of new mobile icons for easy access to commonly performed tasks. Geometry associativity has been enhanced to include material, geometric, and contact capabilities. This will provide complete associativity between the CAD model and the finite element discretization. The associativity is maintained with CAD model changes through Boolean operations (union, subtract) or geometry modifications like blending or chamfering. Mentat 2016 introduces a new capability to imprint the geometry of one or more entities onto another solid, enabling mesh congruency between solids, and better quality results in this region. MSC Software is one of the ten original software companies and the worldwide leader in multidiscipline simulation. As a trusted partner, MSC Software helps companies improve quality, save time, and reduce costs associated with design and test of manufactured products. Academic institutions, researchers, and students employ MSC’s technology to expand individual knowledge as well as expand the horizon of simulation. MSC Software employs 1,200 professionals in 20 countries.